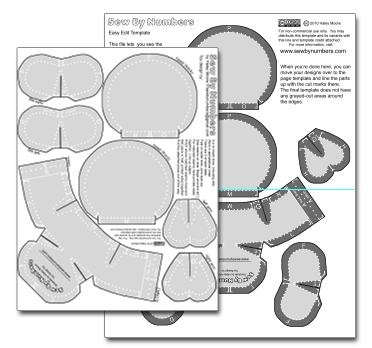 This is the blank template for designing Sew By Numbers dolls. Downloading this is the first step toward making a doll of your character. We also have an easy edit page that makes it easier to visualize the relationship between the pieces. I usually design on this one, and then import my doll pieces to the page template when I’m done. If you would like to submit your doll to be featured here, send your design, along with a photo of the assembled doll, to sewbynumbers CAT gmail.com. Pro tip: For easy assembly, make your stitch marks contrast with the background color of the doll. Use white for dark backgrounds, and dark complementary colors for light backgrounds.